Stunt or adrenaline motorbikes are unique and are often designed for individual riders. Most stunt riders begin with a regular motorcycle before they modify the bike for stunt or extreme riding. The end result is a motorbike that is sharper and versatile. Individual modifications often depend on how ambitious the rider wants to be, as well as budget considerations. Most stunt bikes are sport bikes, typically with modifications. 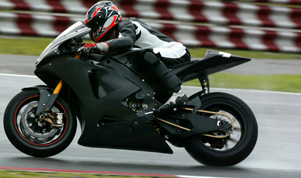 Sport bikes offer good speed and acceleration, as well as better braking and cornering capabilities than standard motorcycles. This type of bike typically features a high performance engine and brakes, advanced suspension systems and a lightweight frame. Foot pegs on are higher than other types of motorcycles, which help riders with cornering. A variation of a sport bike, the streetfighter has a more aggressive look. Common modifications include the removal of the bike's fairing, installing large and round headlights, and fitting the bike with tall handlebars. Originally, these bikes were modified from sport bikes. Since the 1990s, streetfighters have also been manufactured by bike makers. A sport touring motorcycle offers similar handling as sport bikes. The difference is better long-distance performance with improved comfort and safety, similar to touring bikes. Ground clearance is relatively high on sport touring motorcycles, meaning these bikes are good when performing extreme riding on winding roads. A larger fuel tank also means the bike is well suited for long-distance rides in remote areas. Dual-sport bikes are used for both on-road and off-road riding. They are designed to handle off-road conditions. Higher than most standard and touring bikes, dual-sport motorcycles have a high centre of gravity in order to ride in rough terrain. Lightweight dual-sport bikes (under 140 kilograms or 300 pounds) are similar to dirt bikes and feature high fenders and ground clearance. This type of bike is suited for rough trails. Middle-weight dual-sport bikes (between 300 and 350 pounds or 140 to 160 kilograms) are designed for riding on smoother trials, as well as graded dirt and paved roads. Heavy-weight dual-sport bikes manage well on gravel roads and graded dirt roads, and offer high speed performance on paved roads. They do not operate well on difficult off-road conditions. A variation of the dual-sport bike is the supermoto bike. These bikes are designed for road racing, track racing and motocross. Supermoto bikes are fitted with smaller rims and road tires compared to other bikes. They are generally lightweight and durable, and are typically available at lower costs. Most supermoto bikes are single-cylinder four-stroke powered dirt bikes. An endure bike features the deep suspension of a motocross bike with modifications to make the bike road-worthy, including a horn and lights. Another specialised off-road motorcycle is a trails bike. Trails bikes generally have no seat or have a vestigial seat. They are very lightweight, and feature small engines and fuel tanks. For track racing, motorcycles are typically customised. These bikes generally do not have brakes, fears or rear suspension, and are fuelled with methanol for higher speeds and greater power. Riders who participate in stunt or extreme motorcycle riding often make modifications to their bikes. Changes can be made on any type of motorcycle, including standard and touring bikes. Modifications allow riders to adapt motorbikes to stunt or extreme riding. The following are some common examples of equipment used to enhance motorbikes for adrenalin motorcycling. A frame slider is a large knob attached to the frame of the motorbike. It reduced damage to motorcycle's shell covering the frame, also known as the fairing. This modification will not protect from cracks to the motor case or the frame. A frame slider is usually enough to protect a bike from most adrenalin motorcycle riding, if the rider does not intend to do any stunts. A crash cage provides riders and their bikes with extra protection, including from drops or falls. Cages are available in a variety of designs and styles, often catered to specific types of bikes. This type of modification is commonly used for stunt riding. Similar to crash cases, subcages are also used to protect motor mounts and the subframe of the bike. Hand brakes are essential for certain tricks where the rider is unable to access the rear brake. Examples of these types of stunts include seat standers, spreaders and highchairs while scraping. Brakes should also provide riders with the best stopping power. There are two types of bars found on stunt bikes. The 12 O'clock Bar or 12 Bars are attached to the motorbike's subframe. They are used when doing a high wheelie, also known as a 12 O'clock or 12'ing, and other tricks where the bike rests on the bars. 12 O'clock bars scrape the ground to protect the bike's exhaust and tail section. Similarly, round bars may also be added. These bars are curved and rest along the contour of the tail section. Depending on the bike, wheels and tires will influence the type and quality of tricks performed with the motorcycle. Most riders will change their wheels and tires in order to provide the best possible grip. Tires and wheels may also be selected to offer better spin and stopping power when performing tricks. Certain bikes may be modified for specific types of tricks or stunts. Some stunt riders will modify their rear seat or cover. These changes often provide a place for the rider to rest their feet when performing a trick, particularly a wheelie. Riders might also modify their bike with an oversized rear sprocket for catwalking. A gas tank might also be flattened or replaced with a customised or aftermarket tank to avoid it getting in the way when doing a trick.